The goal at that time was to complete the draft legislation by August. It’s December now, so a little bit behind schedule but then again, appropriate because this is the holiday season and there is no greater gift our community could receive than a national park. It was not too long ago, that very exceptional group of people—the committee of five– handed legislators their initial draft, after investing an entire summer’s worth of considerable thought, constructive discussion and personal time away from work and family. Since then, Senator Mark Udall and Congressman Tipton have done more than their due diligence to put that legislation under critical review in Washington D.C..
Those of us with Grand Valley Region Citizens for a National Park would like to offer sincerest thanks to the appointed committee of five who duly laid aside any political or private agendas to put the Grand Valley community and our magnificent canyons first. Glade Park rancher Warren Gore, Kristi Pollard whose experience regarding oil and gas concerns was invaluable, to Michael Burke of the Grand Junction Chamber of Commerce, to Jamie Lummis, of Moody’s Insurance who is also a member of GJEP and represented the local cycling community, and to Ginny McBride who always faithfully represents the Colorado National Monument. The committee is now arranging to meet in just days to take a final look at the legislation, review and revise and then make it available to the public. U.S. Rep. Scott Tipton and U.S. Rep. Mark Udall share an enormous concern that the Grand Valley continues to struggle economically while eastern Colorado continues to grow and prosper. I can only assure you they have been working extremely hard behind the scenes to ensure our community driven draft legislation undergoes a meticulous review by their staff, so that when it reaches their committee’s for final review, it will have every chance of successful passage, just as Pinnacles National Park, Black Canyon of the Gunnison National Park and Great Sand Dunes National Park passed before it. U.S. Rep. Mark Udall’s father first began his family legacy of preservation by helping to create some fantastic national park lands in Utah. Mr. Udall will continue that family legacy with the Colorado National Monument to national park proposal and others to create national monuments. U.S. Rep. Scott Tipton’s family knows better than most the economic impact of a national park. Tipton founded an impressive business in Cortez decades ago, selling American Indian pottery. According to the Wall Street Journal, Mesa Verde Indian Pottery and Mesa Verde Trading have become some of the best-known pottery firms in southwest Colorado’s Four Corners region . Mesa Verde National Park has supported Mr. Tipton’s family and thousands more like his for decades catering to the international and national tourists who flock to the World Heritage Site. Also, when towns around Pinnacles National Monument were suffering an enormous economic downturn, their communities lobbied Washington extensively trying to persuade them to grant a long time dream of a national park. Mr. Tipton was on the committee that approved the elevation of Pinnacles National Monument to a national park and helped address that area’s economic crisis. One year after it’s designation Pinnacles has seen a 33 percent increase in visitors which equated to an additional 90 thousand visitors this year over last. Today Mr. Tipton has the chance to do the same here in Mesa County, for our canyons, our residents and our businesses in his very own district. Today in those California towns near Pinnacles National Park (as in Montrose near the Black Canyon of the Gunnison National Park) the immediate international recognition, branding, and foreign tourism has become a vital part of healing a stagnant economy. The same is true to our south in Montrose. When local leaders there work to recruit new business Jenny Sopsic, Executive Director of the Montrose Chamber of Commerce tell me the national park is their number one asset. Montrose sales and use tax revenues, along with lodging tax revenues (unlike Mesa County) are up and growing. The county and city have attracted so many big box and smaller new businesses Montrose residents who used to regularly shop in our town and visit our mall during the holidays…according to Sopsic now stay in Montrose to shop. 1. 72 percent of 250 respondents still view the local economy as weak or extremely weak, not a significant change from last year. 2. 41 percent will continue to delay capital investments for the next six months because of the economy. 3. 14 percent expect to cut some employees. 4. 29 percent are now less optimistic than last year. 5. 49 percent believe it will be 2015 or later before we see the economy BEGIN to recover. It’s fully within the realm of possibility, once the appointed local committee releases their draft legislation, our representatives could use their expertise to officially introduce this legislation after the January session begins and with due diligence put it before the two deciding committees to which they belong before April and spring thaw in the rockies. While we deeply respect the measured, entirely community driven and highly thorough approach our legislators have taken, after 107 years of on again, off again discussion and exhaustive review within our community, we believe our representatives have all the information they need to move forward. Our community has waited long enough. Now, that hard won draft legislation exists we call on Senator Udall and Congressman Tipton to act with a sense of urgency to introduce official legislation to elevate our monument to a national park in the upcoming session. There is indisputable historic community precedent for this effort. 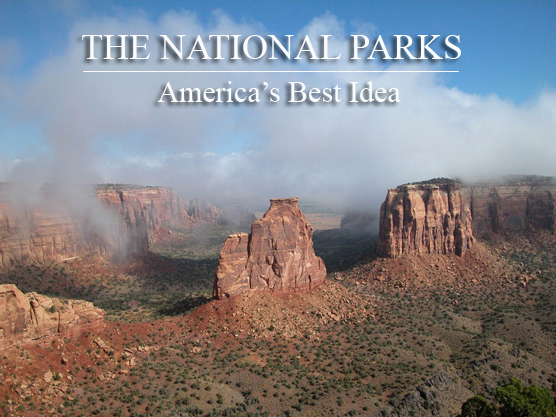 Unlike the vast majority of U.S. regions who would love to have a national park, the Colorado National Monument meets every exacting requirement for park status. Those are the top reasons the CNM should be elevated to a national park but as numerous realtors, builders, restaurant, hotel, and winery owners anticipating park status tell us, the instant national and international exposure that comes with park status would also help lift them and our entire economy out of the current morass of a lingering recession. Not just the Grand Valley but all of the struggling Western Colorado towns surrounding us would benefit from increased tourism. Per the VCB’s request, I’ve written a letter your members can forward to our representatives asking them to act with urgency, foresight and leadership and introduce legislation in the current session. 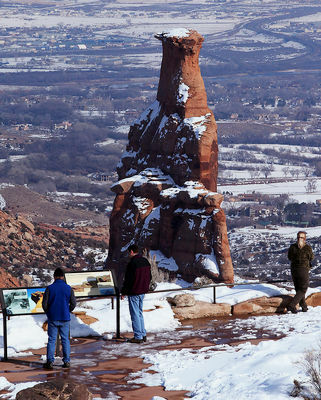 Legislation to upgrade Colorado National Monument to a national park could be introduced as soon as January, supporters of the move said Tuesday, hailing the prospect as a much needed economic boon. “We could be a shining star” in the regional economic picture iwth the prosepect of a national park overlooking the Grand Valley, said Theresa High, owner of High Country Orchards and Colterris winery, both in Palisade. With the prospect ofa bill approaching, High and Terri Chappell urged the Grand Junction Visitor and Convention Bureau board on Wednesday to gather support fromt he tourism industry for the effort. Chappell ticked off a series of bleak economic indicators for the Grand Valley, highlighting a finding that 49 percent of respondents to a Grand Junction Area Chamber of Commerce survey said they didn’t anticipate economic improvements before 2015. Promoting the 20-thousand acre Colorado National Monument to a national park could reverse much of that pessimism, Chappell said. U.S. Rep. Scott Tipton, R-Colo., and U.S. Sen. Mark Udall, D-Colo., this summer appointed a five member committee to draft a bill and that committee’s work is nearly done, Chappell said. “When people in our town hear the detail (in the bill) they’re going to be extremely gratified by the work of the committee, ” Chappell said. Glade Park access was a sticking point residents voiced amid fears that national park status could jeaopardize their ability to use Rim Rock Drive to reach DS Road from the east entrance of the park. 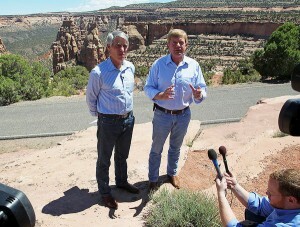 Congressional sources said the staffs of Tipton and Udall are to get together this week to discuss the measure. With the prospect of a bill approaching, tourism and travel promotin organizations need only to be notified to gear up support for the bill, Barbara Bowman, manager of teh VCB, said. “They will step forward on our behalf.”. Bowman said. High Country News recently allowed two contributors to comment on national park status for the Colorado National Monument. 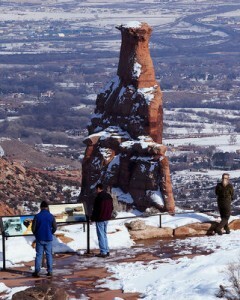 While Charles Quimby’s statements were issued as a “con” in comments after he states that he has not said the monument should NOT (his emphasis) be a national park. We’re so glad! Below is a link to those articles. I should say we always appreciate the opportunity to address the facts regarding this issue. While we fully disagree with Quimby’s arguments for reasons stated in comments below the article, we absolutely support his right to express his opinion. Coca Cola is running a contest that could make a national park unit 100-thousand dollars richer! The Colorado National Monument is the natural choice because we are the only park with the “real thing”… red rock coke bottles! 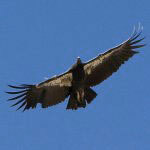 Vote here and take note, if you read close there are ways you can get extra votes for your park. Spread the word! The following article appeared May 31, 2013 in USA Today. You can find it in full at the following link. As we have said would be the case for the Colorado National Monument should it be re-designated as a national park, no rules or regulations regarding Pinnacles have changed, simply the name. But! Because of the name change new tourists are finding their way to Pinnacles and helping local wineries and the economy in general as they explore the nation’s 59th national park and it’s surrounding towns. 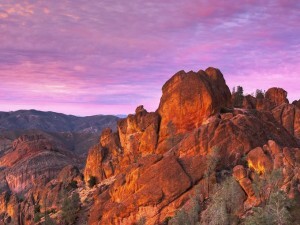 Pinnacles was officially named a national park in January. 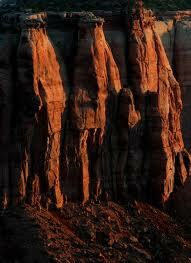 If the Colorado National Monument is re-designated it would become the nation’s 60th national park.